Decided that this was the best set up for the rear as it helps with parallel parking! Interesting gap between edge of floor and side of van!? Last edited by john&hannah on Sat Jun 30, 2012 3:26 pm, edited 1 time in total. initial thoughts are if it was not AWD the red9design would be the plug and play option but no room for drive shafts etc. It is almost asking for a front/rear red9design contraption. But my other choice and the one i am really leaning toward is to fabricate and space frame chassis from scratch. just done some measuring and interestingly the rear track for a 993 is 1444 and for a 944t is 1451. Soooooooooooo what I am thinking is if the 944t is a known way to go and the dimensions work then there could be a chance for the 993 subframe with some tweaking. Last edited by john&hannah on Tue Jul 10, 2012 4:09 pm, edited 1 time in total. Sounds like a great project. Always fancied it. Why not use a G50 box. Always been a better route. Is it because you won't be racing/pushing it or just cos you got the earlier box? Where are you based? Would love to see this!!! Good luckk with the project. The best solution from an engineering point of view is to use as much of the porsche kit as possible. As well as the 964 running gear and drive train i could also use the 993 variant as a donor as most parts are interchangeable. All i need to do now is fine the donor parts from a source that doesn't add a premium onto some rusty parts because it has porsche written on it! Fat chance. which seems to prove that i can fit the G64 gearbox onto my 2.0L engine. I like this because i want to keep the 2.0 lump with its triple webbers as i think it looks great sitting in the back of the bus. .............and if i get bored the swap to something bigger is easy enough! But lets walk before we run and get this one done first. Last edited by john&hannah on Sat Jun 30, 2012 3:49 pm, edited 1 time in total. John or is it Hannah? good luck with this something very different I'll be watching with interest. P.S. if you use the [img] quotes rather than the url ones make it easier for folks to get on board and I think you can pick larger image sizes too off your flickr page. Good Luck with it btw. thanks for the tip, was wondering how to do that. I have just got my hands on the front sub frame and running gear from the same donor 964. Just a matter of gorilla taping it all together. slight problem, not sure these bits are now relevant! Glad i shot blasted them. Anybody doing a 2WD project?????????????? Last edited by john&hannah on Sun Jul 22, 2012 5:46 pm, edited 1 time in total. knew it was all going too well!! Is this a known vw factory join point??? Will have to source a set of bespoke drive shafts as the units will be mounted closer to the gearbox than originally intended. have just picked up some of the component parts and its starting to feel like a project! 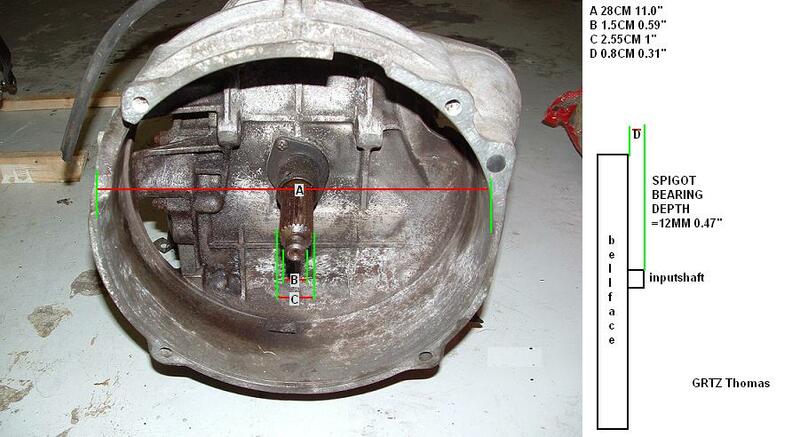 Gearbox, torque tube and front diff in relevant position. The centre to centre of the drive flanges is 2250mm which is encouraging when compared to the stock 2400mm on the original wheel base for the bus. Without extending the torque tube (which i presumed i would have to do) i only have to lose 150mm in the centre of the hubs, which i may be able to do with the drive shaft tolerance.